Cluster Headaches are actually considered to be a sub category of Migraine and are amongst the most painful types of headaches. The onset of these headaches is typically between the ages of 20 and 40 years old with a male to female incidence of 4:1, however exceptions do occur. The term Cluster Headache arises due to these headaches occurring in clusters of a number of attacks of pain in the face or head, usually short lived in duration and very severe with often many months between clusters. The cycle of attacks with periods of remission is usually repetitive over time with the sufferer almost able to predict the onset and duration of the next cluster. 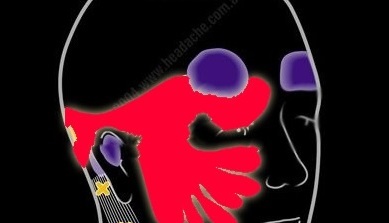 There is usually no aura or visual or neurological symptoms associated with cluster headaches however nasal stuffiness and tearing on the side of the headache is common. Cluster Headaches usually occur around the eye, nose and ear regions and the pain is often described as excruciating and lasting minutes, up to an hour. Less commonly pain can be located around the top or back of the head, even front of the neck region. Treatment for Cluster Headaches is usually targeted towards relief of the severe symptoms using various medications such as Ergotamine and Corticosteroids as well as Oxygen therapy administered early during an attack. Preventative treatments may be of great value but are difficult to assess due to the rapid onset and short duration of attacks. It is also important to note that many headaches and migraines have a number of ‘ingredients’ which combine to produce head pain. For further information please see the rollover sections on the homepage head illustration to see specific problems in specific parts of the head, neck and face as well as the ‘Treatments’ section.